We just can’t get enough of Bali. Which Bali bogan are you? AS SOON as we Aussies touch down in Bali, our inner bogan starts to shine bright like a diamante. Everything we do or say becomes amplified in comparison to the gentle, polite and peaceful Balinese. Our behaviour comes across out of context, like that preacher guy at the Royal Wedding - OK in his country, way too much in another. We don't mean it of course. The majority of us try to behave like we aren't bogans, but it's there inside waiting to take over the second our thongs slip on our feet out the front of Denpasar Airport. The OG kinda B can be found in Kuta's Poppies Lanes getting French polish shellac nails or their kid's/dog's face tattooed on their arm (sometimes both). These are your classic Bali bogans who have been buying holiday packages to the same resort since 1991 and spend their whole trip swimming in the three pools, necking Bintangs at breakfast and accidentally ashing out durries at the swim-up bars. 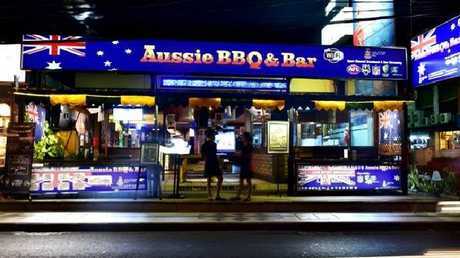 The OGB can and will tell you where to get the cheapest massage within two blocks of their hotel, and what to order at the Aussie BBQ restaurant down the road. Their penchant for day trips is as exceptional as the deal they can cut on 10 fake Ray-Bans, and include; ATV tours (quad bikes, white water rafting, parasailing etc), trips out on glass bottomed boats, and any activities with potential animal abuse. Seminyak is the stomping ground of the BSB who tosses up between staying in five-star hotels or private villas with their own pool. They travel in packs - be it groups of friends or families - orbiting together around the shops and restaurants on the main strip of Jalan Oberoi. BSBs love a sunset bar and go to every single day club on the island - swimming at the fake beach at Mrs Sippy, taking selfies from Omnia's clifftop infinity pool, and slamming cocktails as the sun drops at Potato Head. They love Australian-priced western food and their favourite place to go is Motel Mexicola where they will eat, drink, dance and then head to the D-floor down the road at La Favela. BSBs are always happy to take a private car out of town for cheap Botox or to go on a day trip to Ubud for shopping, monkey selfies and buying direct from a silversmith. HiBos love to talk about how they travel off the tourist trail, yet all seem to find their way to the beachside town of Canguu. The once peaceful surfing spot is now crammed full of tanned babes with Mexican day-of-the-dead tattoos, the majority of whom are there to start their own jewellery business or clothing line. HiBos check into small-scale hotels where they make friends with the owners who they text occasionally once they're back home. Making other friends via Tinder, they zip around on their scooter sans helmet, between facials, massages, surfing and eating at places such as Crate Café where food quality, prices and restaurant decor are as important as socialising with those on the neighbouring tables (but still not as important as happy hour at Old Man's bar). HiBos love boasting about what they've ordered on the delivery app Go Jek (like IV hangover infusions) and discussing which is better - partying on the Gili Islands or surfing at Uluwatu? A: hiking a volcano at sunrise. 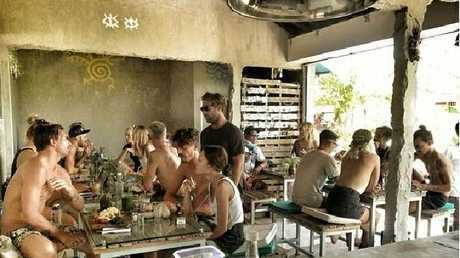 The YoBo can be found lining up at 9am on a Sunday to buy a ticket to an ecstatic dance class at Ubud's Yoga Barn. They're only into organic vegan dining and won't touch anything else, unless they buy it direct from a produce market. The posher ones - the PoYoBos - can be found relaxing around their boutique hotel's jungle pool, having just finished a spiritual tour of cleanses, colonics, silent retreats, meditation and yoga accreditations, breathwork, tantra and rebirthing classes. YoBos thrive on telling everyone via social media how grounded they are and announcing that they're going to start a career as a spiritual life coach once they return home. Straight to Sanur, ReBos love to keep it chill and stay at the same beachfront resort for their entire trip. They begin the day walking up and down the beach trying to get the best sunrise photo, using their pool towel to reserve their favourite banana lounge before they hit the breakfast buffet and then go hell-for-leather on getting a tan between daily beach massages and pool dips. 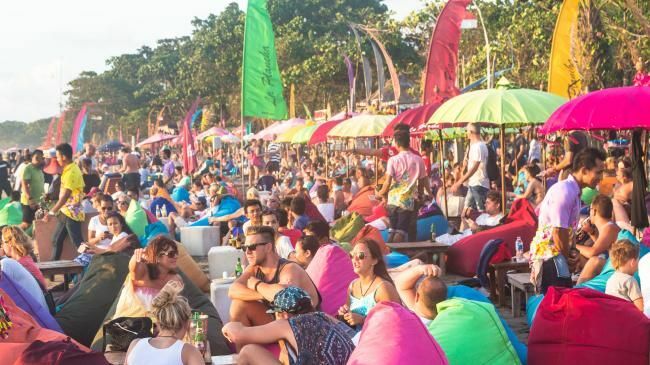 They buy bags of souvenirs for the family back home and their evenings are spent at the hotel restaurant, followed by Bintangs anywhere on the main drag that has live music. Copy, paste, repeat. Love youse all. Whatever your brand of bogan. 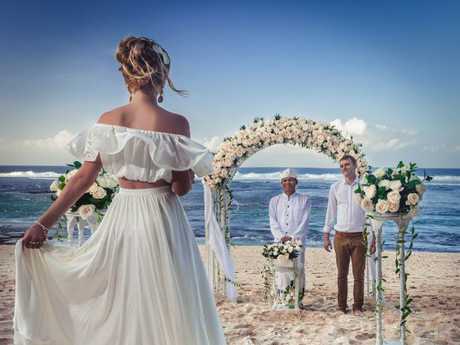 LUBs are found all over Bali saying their vows under heart-shaped frangipani arches on the beach in front of the hotel where the couple, their family and all their friends are all staying. Fake tan, ankle bracelets, piercings and a bit of extra "work" is usually on the cards for both. The groomsmen don linen suits, the bridesmaids rock dresses that show off their lower-back tattoos and everyone in the wedding party is barefoot. The free flowing Bintang goes all day long, there will be at least three fully-clothed guests in the pool before midnight and most post-wedding group activities will be cancelled because everyone is too hung. So, hold the mirror to your sunburnt face 'Straya - which Bali bogan are you? 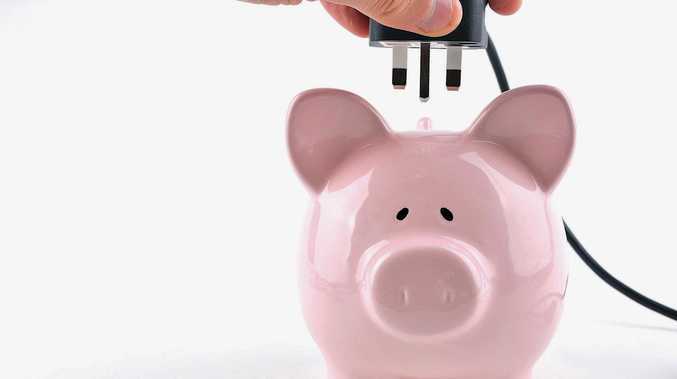 For more travel news and advice sign up to Escape's newsletter.